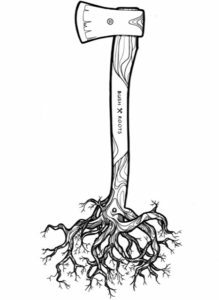 Out in the Bush, especially in the North, the Axe is one of the most important tools an outdoorsman can have. 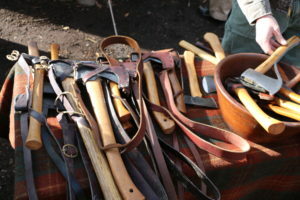 There are many styles, lengths, makes, and types. In this camp there will be something for beginners all the way to experts. 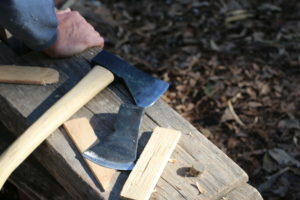 Chopping, splitting, restoration and maintenance classes will be covered as well as small axe and hatchet use, and how it applies to a wilderness situation. Axecraft Camp will be facilitated by several individuals throughout the event. Each person will present skills and teaching techniques that they have found valuable through their educational programes. 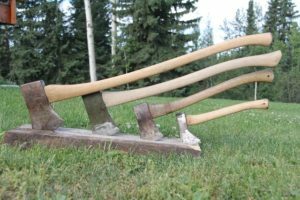 Note: The Axecraft theme camp is currently looking for a financial sponsor. If you are interested in providing some of the above, and would like an opportunity to showcase your talents and/or wares, please contact us.